Jack is five and a half, and in Ontario that's just legal. I don't know much about what Jack was like as a puppy because we didn't know each other then. We adopted him about two years ago, before we got him, he was abandoned at a kennel. His previous owners dropped him off, and said they would be back in two weeks. They never came back. Even though it is sad, I'm glad it happened because we would have never met him otherwise. I remember the day we picked him up, he followed us to our car and never looked back. 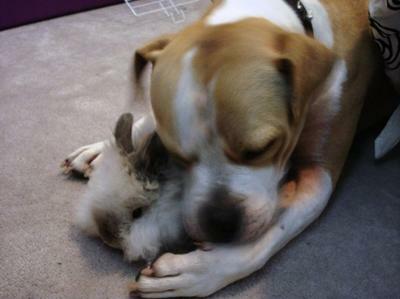 Today Jack enjoys spending time playing with his toys, and cuddling with us and our bunnies.